Knock Poker is a variant of draw poker that doesn’t require gambling. Games are quick, often lasting no more than a few minutes. You can play with two to six players. The object of Knock Poker is to form the best five-card poker hand. Knock Poker requires one 52-card deck. 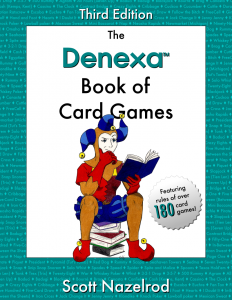 If you really want to make your game night shine, you’ll need a great deck of cards. 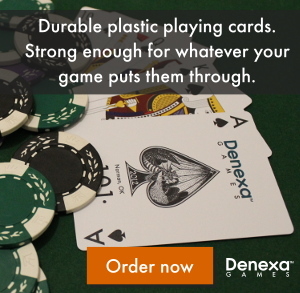 Get a deck of deluxe Denexa 100% Plastic Playing Cards and wow your friends. Deal five cards to each player. Place the remaining deck stub in the center of the table, forming the stock. Turn up the first card of the stock and place it next to it, forming the discard pile. The player sitting to the left of the dealer goes first. On each player’s turn, they have the option to draw the top card of the discard pile, adding it to their hand. If they don’t want it, they draw the top, unknown card of the stock. The player then discards one card face-up to the discard pile, returning their hand to five cards. Play continues on with the next player to the left. 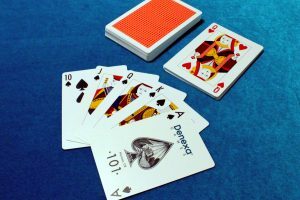 Play continues until any player is satisfied with their hand. After discarding, they knock on the table, signaling this to the other players. Play continues, with each player taking one more turn to finalize their hands. When the turn of play returns to the player who knocked, hands are then revealed, with the highest-ranking poker hand winning. That’s something you’ll have to make sure everyone agrees on, as different groups of players are sure to have different ways of doing it. One fair way of doing it is that all ties go to the person who knocked. If the person who knocked isn’t involved in the tie, the first player to the left of the knocking player wins. You can also avoid the question altogether and just rule the hand a tie. This is most accurate to standard poker rules, after all—ties in poker games with betting split the pot. while your playing and you run out of cards and nobody knocks ? At that point, you can simply reveal the hands and whoever has the best hand wins.